Volcan Tungurahua, near Banos, Ecuador erupted again on December 4 which made us virtually cross this stop off our list. Once in Cotopaxi, we spoke to several travelers who had just stopped through and said it was fine, although the volcano was still puffing away. Supposedly the winds were fast enough that the ash was being carried away from town. This all sounded very interesting. 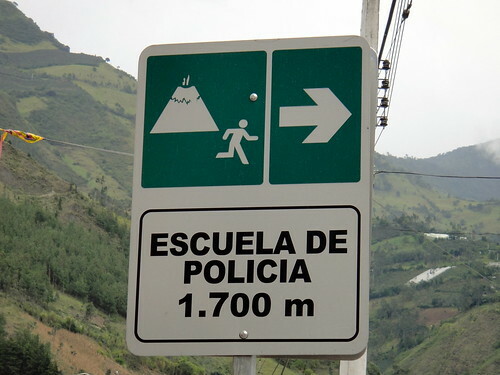 As in many places in Ecuador, we hopped on a bus headed that direction. Toward the end of the trip our bus rounded a corner and the great smoking giant came into view. Even though we’ve seen erupting volcanoes before, it still isn’t getting old. As with several cities on this trip, Banos was nothing like what I imagined. It’s a small town with famous baths that come from hot springs and are colored by the high mineral content. We didn’t go in the baths, because they looked like pee water. More interesting to us was the volcano, of course. Banos is protected by a mountain between it and the volcano, so it was difficult to see most of the time. However, there were many reminders that it was there, such as the numerous evacuation route and run-like-heck-if-that-thing-blows-its-top type signs. 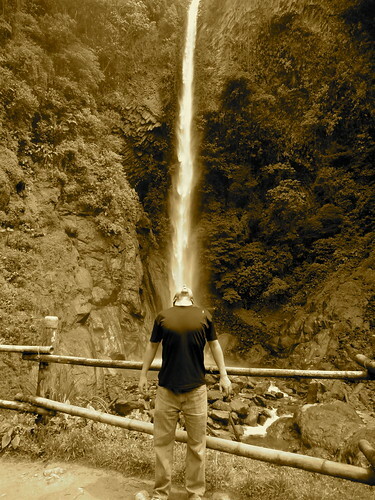 Aside from the volcano, Banos also sports a good number of waterfalls. We decided to check them out via quad runner. We didn’t do any off-roading since there was no where to off-road except off the side of the mountain. 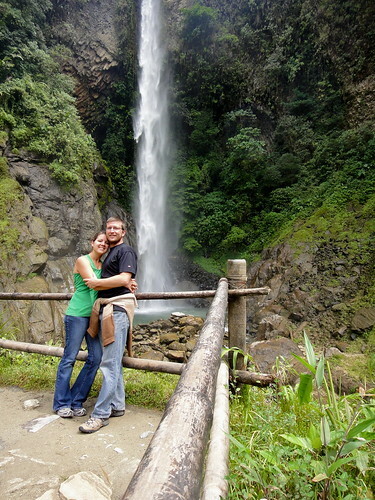 But, mingling with waterfalls, buses, cars, dogs and other Ecuadorian roadies was still fun. There are a bunch of these quad runner rental people around town and they all cost about $8 to $10 an hour. We spent 3 hours following the map we were given and trying to stay out of the way of passing buses. Click to see more of pictures of Banos de Agua Santos.